After working with stained glass in the St. Louis area for a few years, the founder C.A. "Jack" Laws gained a passion to create stained glass windows. After serving in World War II, in 1946, he returned to his hometown of Statesville, North Carolina with a newlywed wife Helen, and began his own studio. Over time, his studio has prospered and now employs over 40 skilled craftsmen who complete over 100 projects a year. Many talented artists and designers have worked at Laws Stained Glass. In the 1950s, German artist Richard Raymer and Dutch artist Franz van Bergen added valuable knowledge ending their careers at Laws. In the 1960s and 1970s, the Gentry brothers, Paul and Charles, helped establish Laws as a leader in the stained glass industry. During the late 1960s, Tommy Crawford began his career that would span four decades. Currently, Nina Haynes is our chief artist, who has been painting on glass since 1977. Our designer is the artist Vincent Ketchie, who has been with Laws since 1998. Though the stained glass industry has not changed much in the past century, Laws continues to be on the leading edge of technological advances. After producing custom steel frames for decades, in the 1970s, Laws began making custom aluminum frames. In the 1960s, Laws was one of the first studios to begin making faceted glass (often called slab glass, chunk glass, or dalle de verre). Today, Laws incorporates computers to design windows. 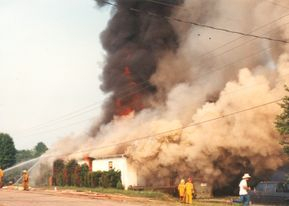 Through the years, Laws has been blessed, but on the afternoon of May 18, 1991, tragedy struck. Through spontaneous combustion, a rag soaked in linseed oil caught fire, and burned the shop down. Tons of glass were melted by the heat. Four completed jobs were lost among the others that were in production. 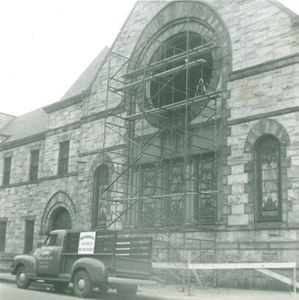 With contract obligations to about 75 churches, Laws began to rebuild. One of C. A. 's proudest accomplishments was the perseverance through that difficult time. "We didn't lay one employee off," Laws said, "We met the payroll. We worked in the driveway. We worked under trees. We did a lot of framework and a lot of other jobs outside that summer." Since the fire, Laws Stained Glass Studios has continued to prosper. From big city sanctuaries to country chapels, Laws is proud of every pane. When asked what attracted him so much about the stained glass business, C. A. said, "I like doing something with my life that other people can enjoy, too." Though C. A. Laws is no longer with us, his legacy continues. His son Michael Laws, who has managed the studio over 30 years, is the president. "I find that one of the most difficult tasks is maintaining such a high quality of workmanship that my father has instilled in this company," says Michael, "In 1988, hurricane Hugo swept through the Carolinas. Charleston, South Carolina was hit very hard. I received a call from Cooper River Baptist Church in North Charleston. They explained that the hurricane had ripped the roof off the sanctuary, but the windows that we installed were still in place. Remarkably, these windows did not have protective covering, and only a few pieces of glass were broken. Dad and I were both proud of the way our windows held up during that storm. Many of our windows in southern Florida persisted through similar hurricanes." "Today, I feel that the structural as well as the aesthetic quality of our windows are as high as ever, maybe even better than in years past. We take pride in our windows, knowing that we are not only serving each congregation but our Lord as well." Along with Michael, his sister Deborah Laws Colyer is the office manager. Grandsons of C. A. Laws continue to uphold his high standards by producing and installing the windows along with numerous loyal employees.